The original Sims 4 had a lukewarm reception. It was missing features and elements that Sim fans expected to be in a Sims game. Through patching and content packs released over the past few years, the game has turned around and become closer to what fans wanted, and with Dine Out they continue in the right direction. 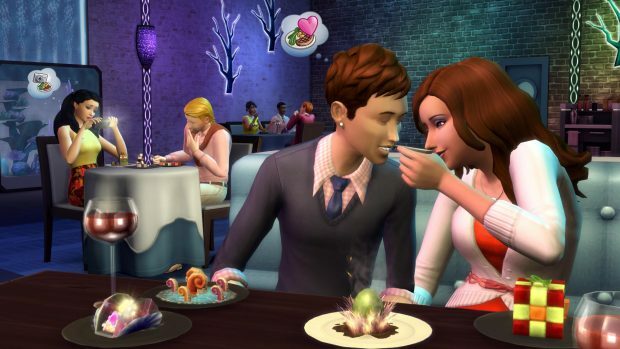 The Sims 4 Dine Out introduces restaurants into the virtual worlds our Sims inhabit. It allows players to go out to eat, own and manage restaurants, and comes with some dining themed items. If you are looking for anything other than food driven goodies, I would skip this pack. If you are adventurous and want to dive into the world of eateries I highly suggest giving this game pack a try. Dine Out does not introduce much, but what it has works extremely well and synergizes on the Sims 4 and all of it’s expansions. The biggest element Dine Out introduces is the ability to buy, build up and manage restaurants. It has great synergy with the Get To Work expansion pack and essentially adds one more way to work and make money. The overall theme of the pack is very well done and allows you to build almost any type of restaurant, from burger joints to cafe’s and all the way to steakhouses. During my gameplay, about five hours into running a successful diner, I decided to change things up. I rebuilt my establishment from the ground up, adding a bar and dance floor, a menu full of exotic food choices and a full swimming pool. That is when I realized the simple nature of Dine Out, while understanding its potential. Dine Out is not just about owning a simple eatery to earn a few dollars: it is about using anything and everything you can from the base game and all expansions to create what you want. In no time at all I had a pool full of patrons, a mixologist serving drinks and dance parties going on. This was not just a new career pack, this was a new element to the game as a whole. It was then that I truly started to enjoy this game pack to its fullest. Talking to customers, comping meals for unhappy patrons, and hiring and promoting my staff became a big focal point of having a well run business. As long as my workers were happy and the customers were taken care of my business ran smoothly and earned a high rating. I found great satisfaction in praising my employees and giving them promotions as their skills climbed, and actually became friends and family with some of them. Same with the customers, being able to remedy a bad situation, or simply welcoming them to my steakhouse felt like I was an integral part of all the restaurant, and not just sitting back and collecting money. In contrast, the included items are a little bit of a let-down. There just isn’t much and, for the most part they are made almost exclusively to use in a restaurant. I learned that if you aren’t running an eatery the items have nothing to do with your Sims day-to-day lives. The items are well thought out in their role however, and have a variety of options to deck out a diner or burger joint. One of The Sims 4 strongest features is also Dine Out’s greatest strength, the build mode. Building a restaurant is easy using the building tools at first. I had a diner set up and ready to go in about 20 minutes. It was small and simple, but it was mine. As I mentioned earlier, my notoriety grew and I spent over an hour perfecting my club/steakhouse. . My restaurant, Tequila Mockingbird, had all the little details you would expect.. Everything matched and was coherent, and most importantly it was a labor of love. I enjoyed building it so much I would actually find myself admiring my restaurant while working, or fixing what I didn’t quite like as I went. It became a part of my Sims existence and his legacy when he retired. The Sims Dine Out managed to do something few games have, it let me create something I was truly proud of and happy to show off my work. The Sims 4 Dine Out is a great game pack that doesn’t offer a lot outside of running restaurants, but it does that extremely well and can be a great deal of fun. Don’t expect much outside of that, but the way it incorporates content from the original game and other expansions, it truly adds dimensions to business ownership, and a great new element to the game overall.